in their respective kitchens in Los Angeles and New York City, where the pair would gather to connect the best way they knew how: Through their love of playing music together. That love continues to this day, and the latest flower of the lifelong friendship between Guest and Nichtern is the Beyman Brothers, a musical group with longtime Guest collaborator and friend CJ Vanston. The trio has made an album of decidedly serious instrumental music (let’s call it meditative Americana) titled Memories of Summer as a Child, which might surprise some since Guest is regarded as one of the funniest filmmakers on the planet. Guest’s resume of hilariously deadpan mockumentaries includes the folk trio send-up A Mighty Wind, the small town theater roast Waiting for Guffman, and This Is Spinal Tap, the iconic 1984 heavy metal comedy that started it all. But long before his comedy career took off in the 1970s, Guest was deadly serious about music, which has played a central theme in many of his movies. Guest grew up in Greenwich Village and attended the High School of Music and Art, a platform for classical musicians. Nichtern’s mother introduced Guest’s parents to each other and their families stayed close. Nichtern and Guest went to kindergarten together, where legend has it that Guest beat up a bully on Nichtern’s behalf. 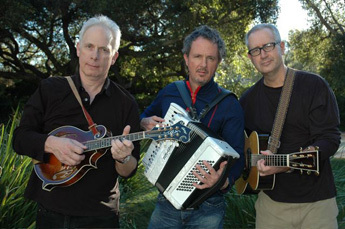 Guest and Nichtern started playing bluegrass music at 13, and they would later form a rock group called Voltaire’s Nose during college in the 1960s. Nichtern says he doesn’t know exactly when Guest became funny. Witty banter is always served up among musicians between jams. “It just so happens that Chris is a black belt at that,” Nichtern says. Music’s central role in Guest’s comedic repertoire dates back to his side-splitting impersonations of artists like James Taylor and Bob Dylan as part of the National Lampoon’s Lemmings tour in the early 1970s. Both Nichtern and Vanston insist that Guest has a secret weapon, and it’s not just his dry wit. Guest abides by a strict philosophy that you can’t have two jokes, and that the music must itself be a serious piece of art, not getting in the way of the joke. Vanston, who met Guest in 1991 and has been working with him ever since, including handling music for most of his films, cites as an example the music of A Mighty Wind, in which Guest and Spinal Tap mates Michael McKean and Harry Shearer play the Folksmen, one of the groups that comes together for a reunion concert. “There are some beautiful songs in that film,” he says. “Some really touching, emotional moments.” One of those tracks, “A Kiss at the End of the Rainbow”, was nominated for an Academy Award for Best Song and performed at the ceremony by Eugene Levy and Catherine O’Hara as their characters, Mitch & Mickey. Vanston has been playing keyboards for Spinal Tap for years, including their raucous Live Earth set at Wembley Stadium in London in 2007. The aging metalheads are perhaps the best example of Guest’s focus on keeping the music serious. Behind the wigs, costumes, accents, and the dim-wittedness, including the amplifier that goes to 11, are talented musicians making spot-on ’70s rock. To celebrate the 25th anniversary of the seminal film, Guest, McKean, and Shearer just finished recording a new Spinal Tap album, including seven new songs, and are hitting the road in April for an “Unwigged and Unplugged Tour,” in which they’ll delve into both Folksmen and Tap songs.